Events in this post occurred in September 2007. Tuesday, September 4, 2007, Kathi and I said good bye to my sister Carol and her husband Lloyd as we were leaving Timber Valley and Oregon behind. We took I-5 south through Roseburg, Grants Pass, Medford and Ashland before reaching the state line. In California we continued south on I-5 past Mount Shasta and Shasta Lake, through Redding and stopped at the Red Bluff RV Park in Red Bluff, CA. 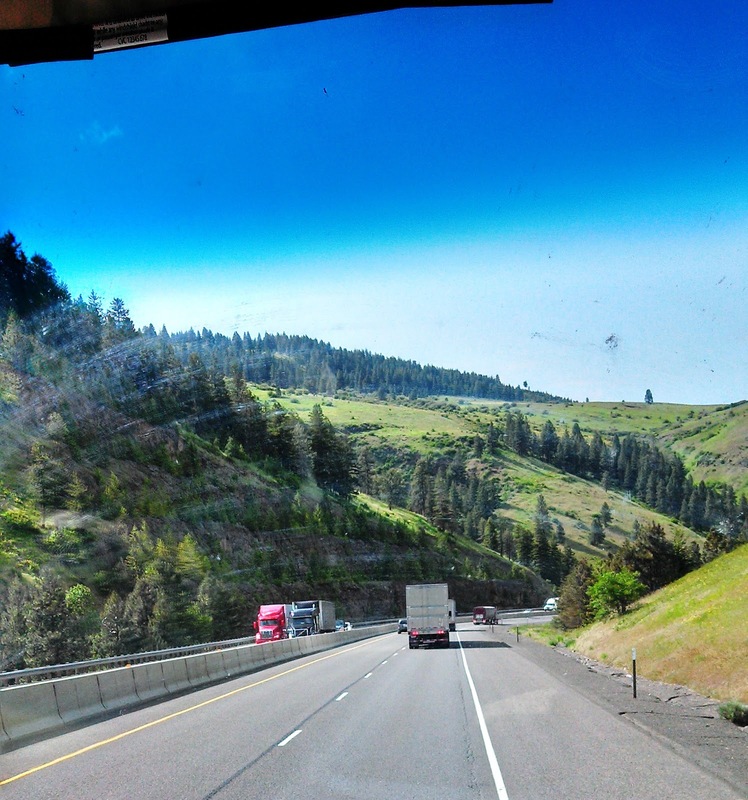 The trip was about 290 miles with the Umpqua National forest to the east of us most of the way out of Oregon. After getting into California we had the Shasta Trinity National Forest to the west of the highway and the Modoc National Forest to the east. Talk about a beautiful drive. Green grass and evergreen trees all along the way. We passed two vineyards that I recall and a tree farm near the highway. The trees on the mountainside made for gorgeous viewing. We even had a stream running alongside the highway for part of the trip. With bright sunshine and the cool temperature inside with the air conditioner running, we had a great time travelling together. California vineyard -- this one is in the Napa Valley. Through the windshield picture. Kathi takes a few while we are driving. Another through the windshield picture. This one is from Oregon. There were too many trees in the RV park to hinder our two satellites, but we moved into space 11 with enough sky view to accommodate us. With our Good Sam discount, the price was $30 per night. We expected California prices to be higher, but this was more than we liked to pay for rent. We paid a weeks’ rent so we would be in one spot long enough for our mail to be delivered. I was anxious to get my new computer. Kathi called our Escapees mail service in Livingston, TX and arranged for them to send the mail to us by FedEx overnight. The mail service people are really customer friendly. I got the utilities hooked up to our motorhome while Kathi made us something to eat. We had peanuts and cashews to nibble on along the drive, but something more filling was needed. 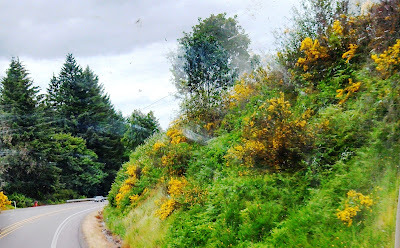 We agreed we would not be anxious to return to that RV park because of the cost and the trees. Most RV travelers like trees for the shade. Our TV satellite dish was in the rear of the motorhome and the internet satellite dish was in the center of the motorhome. Assuring we had a spot that allowed both dishes to see the satellites was a real pain for us. The temperature in Red Bluff was in the high 90’s, but since space 11 had us pointed north, we could have shade trees on each side that helped a little and still got good satellite reception. We backtracked to Redding on Wednesday to have lunch. We drove the 30 miles north on I-5 and drove around the city looking for a restaurant that attracted us. We drove around for over an hour before we saw a Red Lobster. Kathi had tilapia and I got the dinner selection for fried shrimp – I was hungry. We were not disappointed. Red Lobster food was great, as usual. They have the same menu all over the country. With our tummies satisfied, we drove back to our RV for rest and relaxation. Another good day following another great trip in our RV. I would love to be in that area right now. The national parks on the west coast are something special. I miss San Francisco but first I would like to spend some time on the Sierra Nevada Mountains at those state and National parks. A ride from the Bay Area up through to Oregon, where you drove on this blog entry, sounds great.The giant redwoods, the General Sherman (maybe Dad's camera is still there). This was a great area you two were driving through. Too bad it costs so much just to park and hook up to water and electricity when you get close to the city. There are a lot of great things to see in California. The high prices and their politics keep me away and I guess those two items are connected. I hate it that I lost the great pictures we took when visiting the General Sherman tree. That was a fun day.